­ Photos by Slaven Gujic GCU News Bureau Ethington Theatre’s production of “Our Town” runs this weekend and next, closing 2 p.m. Sunday, Nov. 27. But don’t let Thanksgiving weekend stop you from enjoying GCU’s wonderful presentation of Thornton Wilder’s 1938 Pulitzer-Prize winning drama.The show has has a perfect message for any time of year and shows us a slice of Americana while giving us a powerful message. It reminds us that times and ways of life may change, but what truly matters is just as true now as then.For tickets, click here. Students get tickets free with ID. For a story about the show, click here. 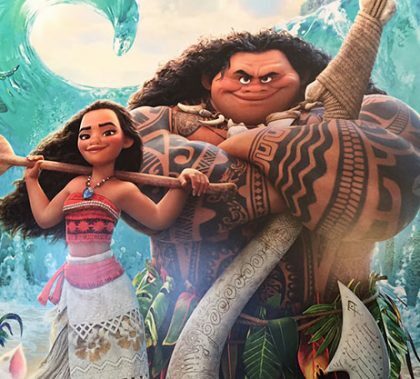 Darrin Butters, a Walt Disney Animation Studios animator, was at Ethington Theatre to discuss the story behind “Moana,” the new 3D animated film about the fierce daughter of an island chief who embarks on a fantastic voyage. The movie is scheduled for release Nov. 23. Toga-clad students, including the nursing delegation from Chanchung, China, packed North Gym to capacity last night for the annual Mr. GCU pageant. Nothing could prepare our Chinese visitors for what they were about to see, but they jumped into the festivities with glee. “Mr. GCU is very inspiring,” said Pastor Tim Griffin, GCU Dean of Students. “But kinda creepy at times.” It wouldn’t be an ASGCU event without a heavy dose of lip-syncing, cross-dressing and man flesh. These are some of the best and brightest young men on campus and those in attendance will never be able to look at them the same way again. Thursday, February 2, at 8 p.m. in the Coliseum (a.k.a. North Gym) 12 men will battle for glory, beauty and pride. But only one will rise to take the crown of Mr. GCU. The humans in attendance must dress for the occasion. Togas all around. For more information and toga tips, contact Sarah in Student Life at 639.6127. Allow us to introduce some of this year’s Greek gods. At least the ones that would lower themselves to respond to us mere mortals. The GCU Run to Fight Children’s Cancer is a one and two loop course around Grand Canyon University in Phoenix, along with a cancer survivor’s walk. Race proceeds will go to the Children’s Cancer Network, an Arizona charity supporting families who have children dealing with Cancer. How does a nonprofit organization manage to stay in business and continue to grow and thrive even in a recession? “You have to think of it not as a charity, but as a business,” says Jim Teter, CEO of Goodwill of Central Arizona, who spoke at this month’s CEO Lecture Series in Ethington Theatre on Wednesday morning. Goodwill originally started as a mission of the Methodist Church to help people with disabilities find jobs. Today, it has expanded to help all types of people find work, from those who have a disability to those who have been unemployed for more than a year or lack certain skill sets. Join fellow students for GCU Safety Week, January 17-20, with events in the Student Union and the Quad lawn north of the GCU Arena. Activities and presenters will be available on campus all week to provide information on crime awareness, drug abuse, sexual assault and other personal and campus safety issues. For more info, call Student Life at 602.639.6892 or student.development@gcu.edu. The GCU Sociology Club and ASGCU Multicultural Director Matt Muchna this week hosted the first of what is expected to become a monthly event: “Wednesdays With the Times.” The forum on current events is sponsored by the New York Times as a way to get college students talking about what’s going on in the world. Free distribution of the Times began on campus this fall. A dozen students and a few Christian studies instructors met in COE 102 for the hourlong discussion. Muchna prepared a short multimedia presentation to prime the group for a discussion concerning the Arab Spring and Middle Eastern politics.